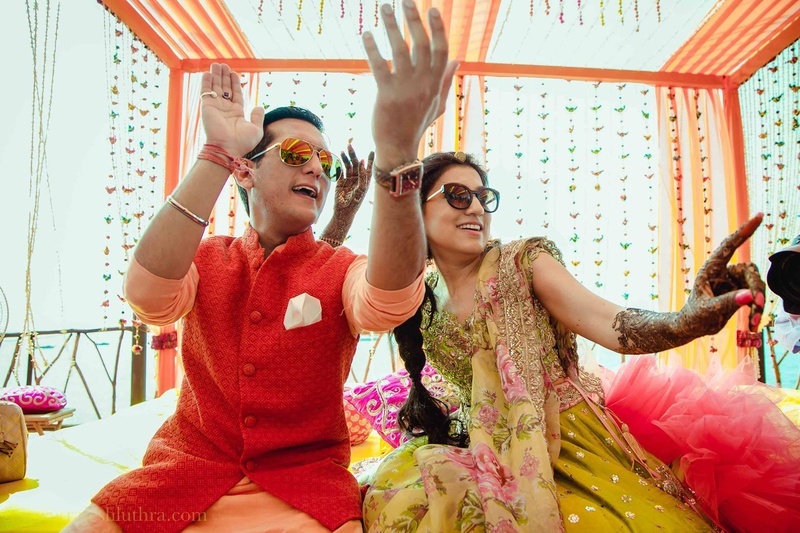 Fun, colourful and lavish – that’s how you would probably describe the Punjabi wedding. After all, no one knows how to party, better than them! Remember all those bhangra dance moves your childhood friend taught you? Yeah, that’s how early they learn how to rock! Traditionally held during the sangeet, tappe is a funny exchange of rhymes and one-liners between the groom’s side and bride’s side of the family. If the bride and groom have separate sangeet ceremonies, the men and the women form two groups and play this game. This is one of the most amusing Punjabi wedding rituals that you cannot miss. Imagine all the women challenging the men with a one-liner that they must rhyme with and reply! Too much fun, we say! Okay. We just love the Punjabi bride for this one! The kalira that is tied to the bride’s chuda (another ritual we just LOVE!) also involves a fun game, played with the spinsters at the wedding. The bride stands on an elevated platform or the girls sit on the floor and the bride then tries to shake off the kalira on each of them. It is believed that whoever the kalira falls on will be the next one to get married! Chooda, a part of the traditional Punjabi bridal attire, is a set of red and white bangles that adorn the hands of the bride. It is one of the first things that lends that bridal glow to the girl and is indeed a special moment. When the relative puts on the chooda, the bride is not supposed to see them till the actual ceremony. Get ready to flood your instagram with some amazing photos! Another fun (may we add profitable?) Punjabi wedding ritual that you must not miss! As the bride and groom’s sister-in-law (bhabi) goes to fetch holy water in the decorated tumbler, the other relatives try and stop them in a fun game. They often demand money in exchange of letting them go peacefully! This water is then used to bathe the bride and groom, following which they get into the wedding clothes. Well, no Punjabi wedding would be complete without the dhols and some cocktails, would it now? This is as crazy as it gets and is one of the modern additions to Punjabi wedding traditions (well, not technically but as long as it’s fun, right?). Go crazy dancing to the beats of the massive dhols and when you are tired, you can sip on some much needed energy drinks (read alcohol). Although we do not need to tell you this, but don’t forget to gorge on the Punjabi wedding food, which is delicious to say the least! Now, go on and practice those dance steps!